Wife, grandmother, daughter, sister, aunt, friend, godmother, and sometimes just “mom”…we maintain a lot of connections to all of these special women in our lives, so what better way to show our appreciation for all of the mothers than a day just for her? Not even this year’s escalating gas prices have put the brake on spending for Mother’s Day, which is the third highest-spending holiday that we track for the National Retail Federation (behind Christmas/Hanukkah/Kwanzaa and Back-to-School). And for this special analysis, we’re taking a look at Mother’s Day spending by specific store shoppers* at several major U.S. retailers. 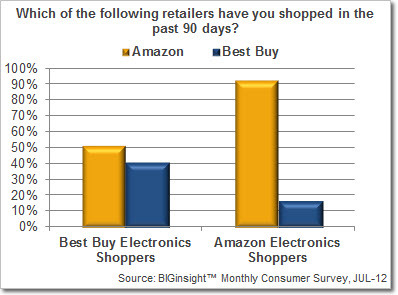 Interestingly – but perhaps not-so-surprisingly – Amazon.com customers are the most likely to head online for Mother’s Day gifts this year. Forty-seven percent of these shoppers are hitting the Internet just for mom this year (their top destination), which vastly eclipses the 25.6% planning to take to the web among the general population. 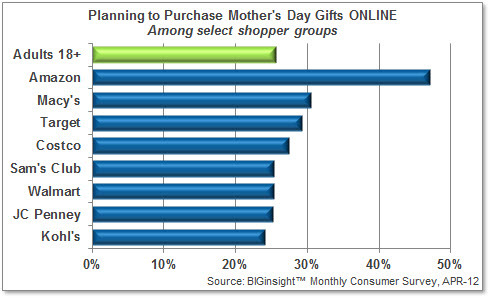 And for more on the Mother’s Day online shopper, see the Shop.org Blog: Key dates and tips to target the online Mother’s Day shopper in 2012. What else can we expect this Mother’s Day? – While Walmart shoppers are the most likely to head to discounters (34.7%) among the retailers we analyzed, department stores (38.4%) and specialty shops (35.2%) will be top destinations for loyalists to the big W as well. – Specialty stores will be the most popular gifting locales for Target, Kohl’s, JC Penney, Macy’s, Costco, and Sam’s Club customers, though Target, JC Penney, and Macy’s shoppers are nearly as likely to head to department stores, too. – Among those armed with tablets, Macy’s and Target shoppers are the most likely to use this device to assist with finding the perfect gift for mom. Three out of five (61.7%) Macy’s customers will use their tablets to research or buy products, redeem coupons, or look up retailer information, while 56.8% of Target shoppers say the same. 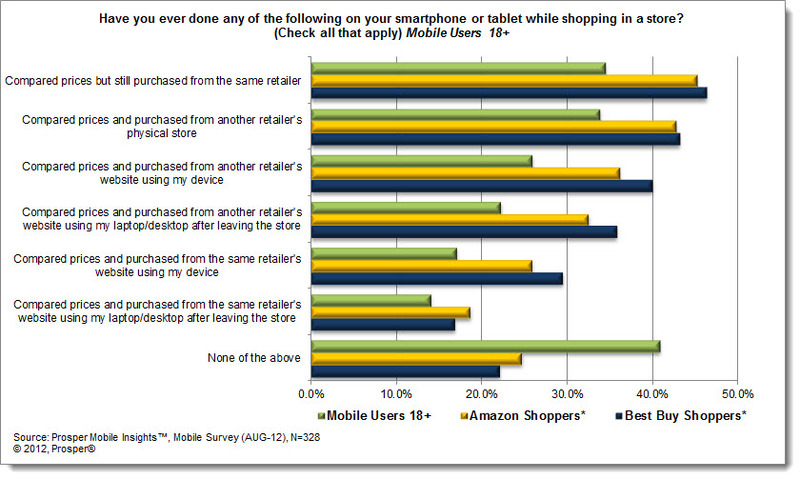 Overall, 51.2% of shoppers who own tablets will use these devices to shop for mom. * “Shoppers” are defined as respondents who indicated that they shopped a retailer most often for at least one major merchandise category (including Women’s, Men’s, or Children’s Apparel, Shoes, Electronics, Heath & Beauty Care, etc. ), unless otherwise noted. Shopper groups analyzed for this report (Walmart, Kohl’s, JC Penney, Target, Macy’s, Costco, Sam’s Club, and Amazon.com) are not mutually exclusive.